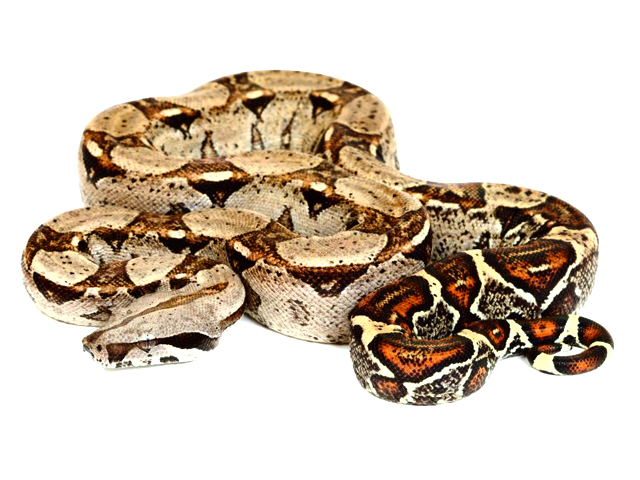 Boa Imperator is extremely popular in the exotic pet trade, due in part to the vast amounts of color and pattern morphs that breeders are creating, as well as their manageable size in comparison to Boa constrictor. Boa Imperator is wide-ranging and as a result, the appearance of this snake varies greatly depending on the specific locality. Typically these snakes are very well tempered and easy to breed. Common Boa Constrictors require a secure well-ventilated cage. Vivariums or plastic storage boxes, can be satisfactorily used to maintain them. Newborn Boas can be housed in an enclosure with about 250 sq/cm of floor space until they are about six months of age. Young adults should be given 0.6-1.2 square meters (2-4 square feet) of floor space. Given space and lots of food, Boas grow very quickly to 1.5 and 1.8 meters (5 and 6 feet) in length, and then their rate of growth begins to slow. By four to six years of age, some adult females will require an enclosure with at least 3-3.5 square meters (10-12 square feet) of floor space. Appropriately sized hide boxes should be provided at both ends of the vivarium so that the Boa does not have to choose between thermal comfort & security. It has been our experience and observation that this species does extremely well on a thick layer of aspen bedding due to the fact that is easy to maintain at a satisfactory level of sanitation. As a general starting point, common Boa Constrictors seem to do best if kept in the 27-28 ºC range (82-83 ºF). It is good maintenance practice to provide a warmer-than ambient basking spot in the 33-34 ºC range (92-93 ºF). This will allow the individual to thermoregulate, choosing the temperature that best suits at any given time. Clean water should be available in a glass or ceramic water bowl at all times. Common Boa Constrictors are rarely observed to sit in their water bowls in conditions of normal health and security. Boas may sit in their water bowls if they are stressed or insecure in their cages (they are “hiding” in their water bowl) or if they are plagued by an infestation of snake mites. Boas are relatively tolerant of changes in humidity & do not require it to be controlled within a narrow band as with many other humidity sensitive snakes. However if the humidity levels are too low Boas may experience difficulty when shedding their skin. The humidity should therefore be increased at this time to prevent any issues. In captivity, young Boas readily eat frozen/thawed mice or rats. Some specimens may eat the food item left in their cages, but some may prefer being offered food using forceps. Large specimens readily feed on rats. One appropriately-sized rodent per week is an adequate feeding schedule for young Boas with adults only requiring only one appropriately sized meal once every two weeks. An “appropriate-sized” meal is one that makes just a slight lump inside the snake. Snakes that are distended from too-large meals should not be handled. For their first meals, many newborns will begin feeding on one thawed large fuzzy mouse or pink rat once weekly. Do not handle them for two days after they have fed if possible. Boas are generally well natured, easy to handle snakes that will move in an inquisitive manner without being over active & uncontrollable. As with all animals their temperament is variable between individuals but generally good if they are not made to feel stressed or threatened. Vivariums & water bowls should be cleaned regularly as required with a reptile specific disinfectant. Common Boa Constrictors generally have few problems shedding their skin. When a snake incompletely sheds, and a portion of the skin is left adhered to the snake, the snake should be soaked in shallow water or slightly-soapy water for several hours, after which the skin typically comes off very easily. Small patches of skin that remain adhered to the snake are not expected to have any deleterious effect and it is at the option of the keeper to arrange for the removal. It’s probably best to see that skin is not left on the face and eyes. Typically, “stuck” pieces of shed will come off with the next shed. Incomplete sheds and adhered sheds are an indicator that the ambient humidity in the cage is too low and the careful keeper will “tweak” the system to increase the humidity. Health issues tend to be rare, but some of the most common include mite infestation, respiratory infection (generally due to incorrect temperatures) & other bacterial & viral infections. If you have any concerns about the health of your Boa consult a vet without delay.